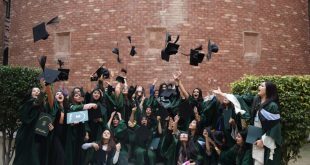 ISLAMABAD (Staff Report): Air University, in its 7th convocation, has conferred 656 degrees to the students of various disciplines related to engineering, business administration, humanities and English literature. According to details, the newly-appointed Chief of the Air Staff Air Chief Marshal Mujahid Anwar Khan, who is also Chairman Board of Governors of the Air University, graced the ceremony as chief guest. Being the 22nd chief of Pakistan Air Force (PAF) after being appointed by the government, it was also his first visit to the university. On the arrival, the Air Chief was warmly welcomed by Vice Chancellor AVM (R) Faaiz Amir, Registrar Air Cdre (R) Muhammad Saleem and other senior officials. Air Chief Marshal Mujahid Anwar Khan, in his address to the convocation ceremony, lauded the role of Air University for contributing in promoting quality education in the country. He said that education plays a crucial role in the development of a country. The Air Chief also congratulated the students and their parents on their success. Vice Chancellor of Air University, AVM (R) Faaiz Amir, while commemorating the academic accomplishments of students, said that Air University is making all out efforts to ensure best quality education to its students in multiple disciplines. “Every field of education has its own importance in the national development ,” he said, mentioning that a large number of Air University graduates are serving different leading organizations at national and international levels. The Vice Chancellor also expressed that Air University is establishing strong linkages with renowned industry players. Faaiz Amir was of the view that students getting hands-on experiences through internship programs and industrial visits are in better position to perform well in the practical life. On the occasion, the Chief Guest Air Chief Marshal Mujahid Anwar Khan also conferred 17 gold and 17 silver medals to the position holders for securing highest marks in their respective disciplines. Four PhD degrees were also awarded. High ranking officials, faculty members, and parents of the graduating students were present to attend the ceremony.